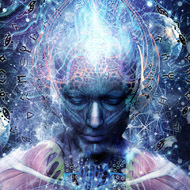 "ARIA nominated Australian artist Cameron Gray creates scenes of the human potential. His works portray a peek through the veil, asking us how we can be greater, live fuller and love deeper. From celestial visions to cosmic animations, Cameron is certainly a frontrunner in the digital art revolution. And with timing so divine, Cameron weaves together the dualistic aspects of light and dark, bringing them once again into a state of oneness."